Coleman Jackson, P.C., operates a broad-based immigration practice that focuses on helping people come to the United States and stay in the United States through family-based immigration petitions, employment-based visas, and naturalization. Our Dallas family immigration lawyer provides caring, confidential assistance to people in North Texas who seek visas, green cards or naturalization or need help with other immigration matters. 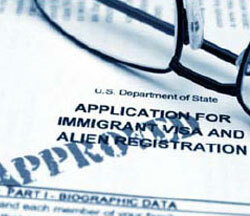 Our immigration law firm can help apply for many types of visas, depending upon your individual situation. When it comes time for immigrants to adjust status, do consulate processing or to become a United States citizen, we help immigrants in the adjustment of status and consulate process — known as getting a green card — and we help with the naturalization process. We help male and female victims of domestic abuse and victims of certain crimes to self-petition for residency. Self-petitions for victims of domestic abuse are allowed by the federal Violence Against Women Act. Crime victims could qualify for a U visa. Understanding U.S. tax law is important for immigrants because they are asked as part of many petitions whether they are complying with these laws. If you or a loved one has an immigration problem, contact our Texas immigration law firm today to schedule an appointment. Call 214-599-0431 or contact us online. We have staff members who speak Spanish, Amharic and Tigrinya.